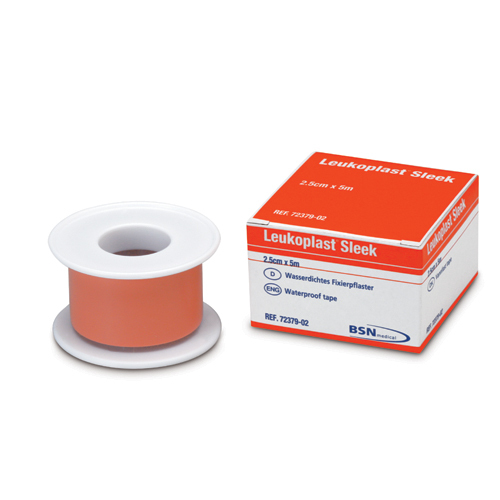 BSN Medical Leukoplast creates a waterproof, high-strength fixation which is ideal for the fixation of dressings and appliances which are likely to be in contact with dirt or water. The plastic film of the tape stretches to mould to the contours of the application area. This adhesive tape is a non-sterile product. Please Note: Leukoplast Sleek contains natural rubber latex which can cause allergies. Below are some recent questions we've received regarding BSN Medical Leukoplast Sleek Waterproof Adhesive Tape, including answers from our team. What type of adhesive is on the tape? Acrylic or silicone? I have contacted the manufacturers who say that the adhesive on the tape is acrylic.